Since 2016, Forbes, in partnership with the Small Giants Community, presents the definitive list of America’s Best Small Companies. This award recognizes 25 privately owned companies that have chosen to be great instead of big. These companies have terrific workplaces, revolutionary products, outstanding services and incredible “mojo,” all of which makes them deserving of this special recognition. We are delighted to announce that ACE Metal Crafts Company is one of Forbes’ 2018 America’s Best Small Companies. Announced at the Small Giants Summit in Detroit on May 17, 2018, Jean Pitzo, ACE Metal Crafts Company CEO and Deb Benning, Chief Relationship Officer, accepted the award on behalf of the entire ACE team. 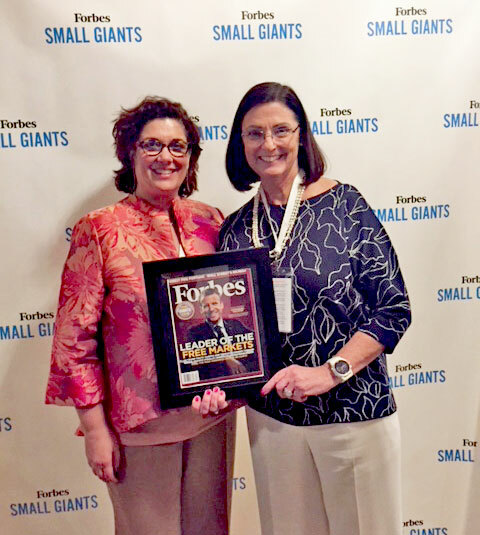 Each year, Forbes and the Small Giants Community review over 200 companies for the award. During the committee review process, several factors are considered, including the company purpose, vision and values. There is a particular focus on company leadership, culture, community and finances. Small Giants offers small companies a collaborative environment, where members are part of a team-first culture; meaning working relationships are defined by empathy, while providing great communication and support, as well as continued learning and development.